Vadstena, what a wonderful surprise! I visited Vadstena to see the Sancta Birgitta Convent, but what I found was not only that, but much more! Vadstena was a true surprise for me. It is a lovely old town with around 5,500 inhabitants, and in each and every street you can feel history. I will highlight a few of its historical places in the next few tips, like the Vadstena Kloster, the Vadstena Slott and the Abbey Church but there is more to see. 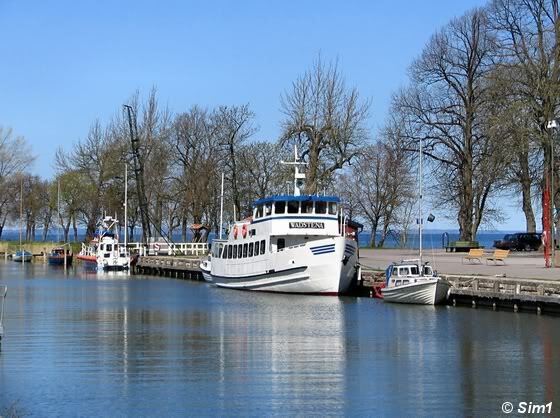 Like the lovely harbour located at Vadstena Slott and the town hall from the 15th century, which is Sweden's oldest. I loved to stroll around in the little streets and in many of the little shops you can buy handmade lace from Vadstena. This is the King's Palace in Vadstena, and at the same time the Vadstena Kloster. Confusing isn't it? Hahaha, I guess a little bit. This building was built around 1250 as a royal palace. 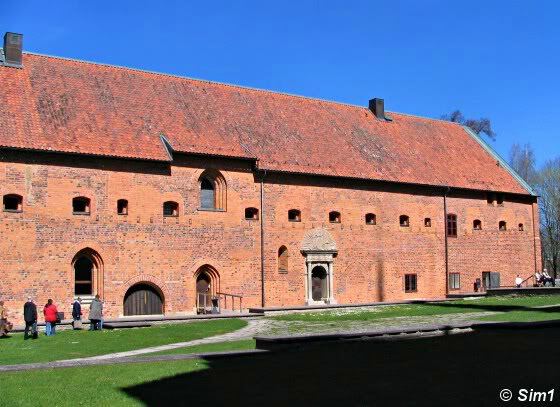 And that makes the palace the oldest and best preserved profane (= not belonging to the church) brick building in Sweden! And of course that made me want to see this building for myself. But the King's Palace hasn't been in use as a royal palace for ever. The building has had several purposes over the years. It started all of as a royal castle but was donated to the nuns in 1346. After some radical changes in the building (like lowering the roof) it was turned into a monastery: the famous Vadstena Kloster (read more about that in the next tip). The nuns lived in the former palace until 1595. But history doesn't stop there, once again the palace got new 'visitors'. In the seventeenth century the palace was used as a prison and after that as a mental hospital. In the 1950's the hospital got a new location and the Royal Palace was restored to its former glory. The present state is a mixture of the Royal Palace and the old Monastery. 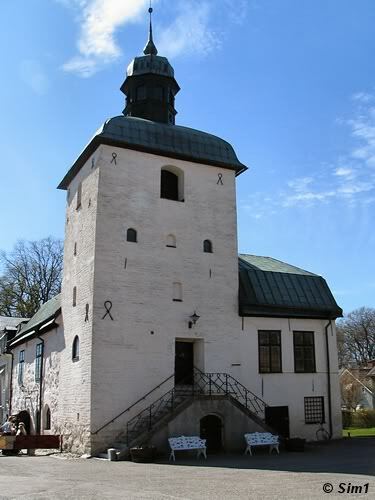 The King's Palace was donated to the St.Birgitta in 1346 by king Magnus Eriksson and his queen Blanche for the purpose of building her own convent. 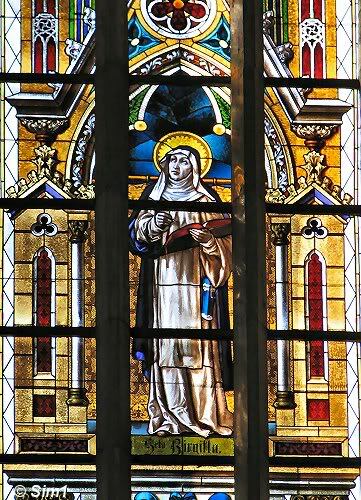 St.Birgitta died in Rome in 1373 unable to see the finished work on her Monastery. The monastery is now the final resting place of St.Birgitta. But what is the Vadstena Kloster like these days? 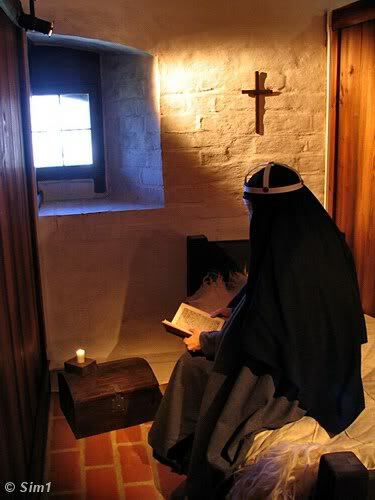 The Vadstena Kloster has now turned into a museum mainly devoted to the life of St.Birgitta and how life was during her era. They did a lot of work creating this museum and the endresult is a great mix of history, displayed through old artifacts but with help of modern technology. This sounds like a crazy mix, but it is excellently done. The whole gives a lively display of life during that time and a fascinating insight into the life of St.Birgitta. I think this is one of the best museums I visited in Sweden and I can absolutely recommend a visit. You can join a guided tour or explore the place by yourself. Or do like I did, make a good combination of the two. students 20 SEK and children 0-10 years can get in for free. St. Bridget of Sweden / St.Birgitte or in Swedish often called "Den heliga Birgitta" (1303-1373) is a name you will come across often when travelling through this area. In many of the places I mentioned previously on this page (Alvastra and Vreta Kloster for instance), St. Birgitte played a role in their history. There is really no escaping the name when travelling here, especially when travelling to the next stop on my trip: Vadstena. And that's why I wanted to share a bit of background information about her. So who is she? And why is she such an important figure? Birgitta Birgersdotter was born in 1303 in Sweden in the region of Uppland. She grew up in a family of high nobility and influence. As a thirteen year old, Birgitta married Ulf Gudmarson from Östergötland, a knight, chief judge and council of the realm. Birgitta had eight children. Following the death of her husband and in her forties, Birgitta had a series of spiritual revelations (more then 600). Her mission in life was to reunite the church with the meaning of God. Birgitta was not afraid and criticised convents in Sweden and abroad, and reminded the king of his duties. She also became involved in international politics and attempted to negotiate peace between France and England in what would later be called the "Hundred Years War". Birgitta often expressed opinions on political issues. She criticised kings and demanded that the Pope, who was living in Avignon, France, move back to Rome. 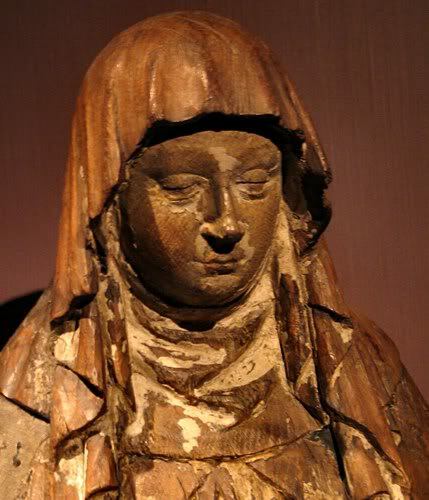 She also started a convent in Vadstena, but more about that in hthe next few tips. Birgitte died in Rome in 1373. In the year 1391 Birgitte was recognized as a saint and in five years later she was exclaimed the Patron Saint of Sweden. In 1999, the Pope declared Birgitte one of the Patron Saints of Europe. Next to the Vadstena Kloster is the Vadstena Abbey Church. The building of the abbey began around 1369 and it was cosecrated in 1430. The church was built by the directions of St.Birgitta, although some alterations were made on her original instructions. The material they used to build this church is blue-grey limestone from Omberg. From the outside the church looks a bit boring, but maybe that is also due to the large trees that surround the church and hiding it rather well. But the inside is well worth the look. The whole feel of the church is that it is light and big and there are lots of nice sculptures and art treasures, for example the Saint Birgitta altarlocker and one of Sweden?s most beautiful triumphal crucifixes. One of the things that cought my eye and that I loved is this glass stained window depicting St.Birgitta. Time hasn't stood still in this church though, lots of changes have been made since the Middle Ages. 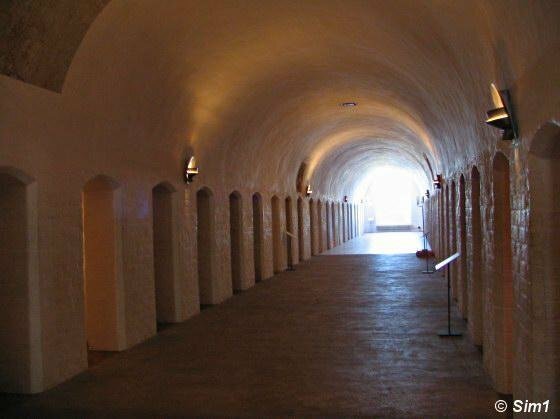 There used to be a gallery for the nuns, a Mariaaltar , a procession gallery and a barrier that separated the abbey people from ordinary people. In the abbey there were also about sixty altars. A total surprise for me during my visit to Vadstena was the Vadstena Slott (slott = castle). Maybe I should confess that I didn't know there was a castle in Vadstena in the first place and seeing this huge castle came almost as a shock. But a good one! It was great to take a nice stroll around the castle, looking at this rather unusual building with its thick walls and picturesque moat. The castle was build by King Gustav Vasa in 1545 as a defence again the Danish. It didn't take long though before it was remodelled (in 1555) and made into a residence for the king's son. In 1716 the castle ceased to be a royal palace and got many other uses. It even has been a storhouse for grain! The castle now is partly in use by the provincial records office and parts of it is open to the public. I didn't go in, so I can't tell you how the interior is, but I got the impression that it is rather bare. Vadstena is located in the middle of Sweden in the region of Östergötlands Län. It is very close to the big lake Vättern. Roughly said it is south of the town of Motala, west of Mjölby and just north of the nature reserve and lake Tåkern. Although Rök feels like being in the middle of nowhere it is still rather easy to reach. The highway E4 (from Stockholm to the south west of Sweden) brings you very close to Vadstena. Take the exit at Mantorp(between Mjölby and Linköping) and follow roas 206 to Vadstena.